Well celebrated occasions are mostly spent with family, friends or loved ones. In this year's birthday, I never missed the chance to celebrate it with my loved ones. Even though they are in the province and I am in the city, I really find time to go home and celebrate it there. 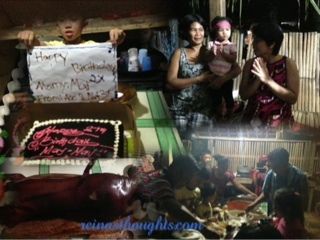 My family and my husband's family celebrated it with me. It was a happy occasion to gather them all. Indeed it was a happy birthday for me.